Now auto sellers can buy display ads from their office, on their terms, and with no money down. All they need is a login to the Ad Wizard's Automotive Sales System from your web site. Once online, a dealer simply calls up a list of their lot inventory (from Cars.com, Dealer Specialties, Dealer Source or other inventory services) and flows it into an ad template with the click of a mouse. Auto dealers like building ads on the system. It gives them the convenience they need and the control they want. Plus they can price, schedule and pay for their ads at the same time. Did you know advertisers actually appreciate being able to pay upfront and by credit card? 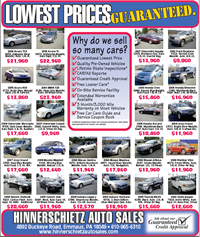 Make it easy for auto industry advertisers to buy more ads from car lot inventory. Enhance a Standard Ad Wizard with your choice of data feed, pagination and other Power Tools. Save your auto dealers time and money: invite them to create For Sale ads from Cars.com, Dealer Specialties, Dealer Source or other inventory services automatically with Automated Data Feed. The Automated Data Feed module for automotive dealers lets advertisers browse and select inventory from regularly-updated local inventory lists. With the click of a mouse their selections flow automatically into automotive ad templates that they can personalize. Another couple of clicks and the complete ad is saved, scheduled and paid for. No more tedious data entry, scanning, faxing, or proofing during their busy business day! Read about other Power Tools, the Automotive Sales System, view Samples or Contact us. Note: The Automated Data Feed module is a Power Tool add-on that requires installation of the Standard Ad Wizard. Offer independant or affiliated car dealerships their own branded pages, sections or entire publications! Reach new advertisers and upsell existing customers while you save on sales and production costs. The Ad Wizard's Pagination feature is easy to use: lot dealers simply check inventory from a Cars.com, Dealer Specialties, Dealer Source or other inventory list and click "Next" to create, schedule and pay for the ad buy. The Pagination module does all the work: it automatically sorts the photo listings, flows them into custom-designed ad frames, adds section starters and fillers, identifies left- and right-reading pages, applies folios, and saves the entire file as a press-ready PDF. Large organizations and high-frequency advertisers appreciate having control and 24/7 access to their ads. Note: The Pagination module is a Power Tool add-on that requires installation of both the Standard Ad Wizard system and the Automated Data Feed module. "Our advertisers find the system easy to use, our sales staff are able to handle more accounts more effectively, and we can now let voluntary advertisers ~ the customers who come to us with ads in mind and money in hand ~ they can now create and purchase display ads day or night." Browse a gallery of automotive created by clients.